Myers's Rum is a brand of Jamaican rum produced by Diageo PLC. Named after brand founder Fred L Myers, the molasses-derived blend of up to nine rums has been produced since 1879. 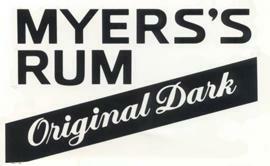 Myers's rum uses only "pure Jamaican molasses" and is "produced from continuous and pot still distillation and is then matured for up to four years in white oak barrels"
Dark rum differs from gold in that some residual molasses is retained in the final product, in order to slightly sweeten the flavor. Rum requires a minimum of two years aging, and dark rum such as Myers's is a blend of rums which can be aged upwards of 50 years. However, the amount of substantially aged rum in a blend is almost always very small.